From 3rd to 24th December, Flaxton Gardens is hosting daily Christmas parties. If you are celebrating with family, friends or work colleagues we have a menu, budget and venue to suit you. WHEN I was growing up here in the Hinterland our relatives often visited and we would do the touristy thing on a very regular basis. My Aunty Elaine loved handmade pottery, we spent hours meandering through tiny craft stalls that were once scattered across the range and inevitably she would meet the potter for a chat. beauty and the demand for their wares continues. I still remember her eyes would sparkle as she marvelled at the beauty in the colours of the glaze and how no two pieces were ever the same because they were hand crafted. There are galleries and workshops all over the Hinterland. Montville is famous because of its quaint village atmosphere where you discover so many quirky shops tucked into nooks and crannies or even behind a waterwheel. It is known as the Artisans Village and is the perfect place to find something very special, you must explore this beautiful little town. That was a long time ago and I admit I didn’t really understand her love and respect for the artisan’s talent. She would buy boxes of pottery then once we got home she would unwrap every piece like she had never seen it before, her joy was profound and unforgettable. If it is food you are after we have so many locally grown and produced morsels that will delight the most discerning foodie. From gelato to fudge to chocolates to handcrafted beers and even a locally produced wine, you will experience flavours that you could never imagine. And the best part is you will more than likely get to meet and greet the person who made whatever it is you devour. So come on Up and discover the true meaning of unique in the many things that are handcrafted on the Hinterland. rbet Ice-cream & So Monty’s of Montville offers visitors & locals a wide variety of edible locally produced products. 98% of stock is locally made with the remainder Australian made. From jams, chutneys, sauces, oils, dressings & dukkah, Monty’s also sells locally made gourmet gelato / ice-cream /sorbet atop a home-made gluten & dairy Free waffle cone which has been prepared on site. Monty’s gluten & dairy free waffle cones can be purchased separately if desired. A range of hot chilli products are now available including sauces, meat rubs, corn chips, peanuts & beef jerky. Monty’s also has a huge variety of 43 milkshake flavours to tantalise your tastebuds & refreshments sourced from around Australia. IT’S HARD to believe that another year is coming to the end again. the recent Queensland Tourism Awards at the Gold Coast. It seems like only yesterday that we were welcoming in 2018, and yet here we are about to say hello to 2019! Australia Zoo, the Country House at Hunchy, Bli Bli House, RACV Noosa, Novotel Twin Waters Resort, RACV Noosa, Noosa Beach House, the Noosa Triathlon and Visit Sunshine Coast’s marketing campaign were all recognised for excellence in their respective categories. As life races on around us, we need to take stock of what is important, and appreciate the value of friends, family and loved ones. It was even more exciting to hear the announcement that the awards are going to be hosted on the Sunshine Coast in 2019, a testament to the emerging sophistication and quality of tourism operators in the region. As we move into the holiday season, I hope that you have the opportunity to visit our wonderful Sunshine Coast Hinterland and preferably spend a few days to relax and re-energise. But even if it you just manage a short visit to stroll through one of our picturesque villages or explore one of the natural walks, I’m sure you will agree with me that we are privileged to have access to such a beautiful part of the world. Best wishes for Christmas and the New Year. Welcome to Handcrafted in the Hinterland DISCOVER the finest handcrafted goods and where talented artisans from all over the world work and live. behind every piece of work, it adds to the sentiment and creates interesting conversation with friends and family. The Sunshine Coast Hinterland has always been respected as a premier destination for handcrafted products of all sorts, and it’s no wonder why with the natural beauty of the majestic Glasshouse Mountains and Blackall Range inspiring creativity in local artisans every day. Rich soil and lush paddocks also make the Sunshine Coast Hinterland ideal for producing handcrafted foods and there is an abundance of award winning products grown and prepared in the Hinterland. Indulge in locally made cheese, gelato, gourmet sauces, spreads, as well as wines and crafted beers, it is so easy to spoil yourself in this foodie paradise. Some of Queensland’s best restaurants and coffee shops are found in the Hinterland, there is so much to experience in the Hinterland from fine dining, a la carte and gourmet to casual dining, boutique cafes and coffee shops. So Come On Up and discover the many handcrafted wares in the Hinterland. is jam packed with facts, useful information, local strories and stunning images of the region. A pull out map, driving and walking map helps visitors to see and experience the best in the Hinterland. All content is found online at www. hinterlandtourism.com.au or visit the facebook page for even more information. So Come On Up we look forward to meeting you soon. PAMPERING & PRIVACY AT HUNCHY HIDEAWAY Hidden in the Hunchy Valley, just 2km from Montville Village, Hunchy Hideaway is a perfect place for couples to relax and unwind and escape from the day to day rush. feel all your troubles fade away. Montville Country Cabins Located in the beautiful Sunshine Coast Hinterland, Montville Country Cabins delivers spectacular views, privacy and luxurious facilities ideal for your next event. We are dedicated to making your event truly special and are pleased to combine our experience and knowledge of local suppliers with our friendly service and professional manner. Stay three nights or more and you will be surprised at the value – midweek three night stays start at $630 in a Rainforest Villa. One night stays are welcome from Sunday to Thursday. Owned by a local family, employing local people Greg Jones – also known as Mr fudgyboombah – samples some of the Montville sweet store’s very popular home-made Scottish Tablet, an old fashioned fudge that is attracting world-wide interest. Mr fudgyboombah makes his fudge on the premises in Montville for customers from all over the world. It is no wonder Fudgyboombahs was voted the ‘Most Popular Business’! THE VAST array of delicious home-made fudges and nougats on offer at Montville’s fudgyboombah has ensured it is a wondrous and magical place. But it’s the traditional Scottish Tablet - an old fashioned fudge made in-house using condensed milk and a tried-and-tested secret recipe - that is proving to be an absolute hero to young and old customers alike. Owner Greg Jones– also known as Mr fudgyboombah - said the unmistakable flavour of Scottish Tablet is having the wonderful affect of triggering memories and transporting customers back to simpler years gone by. “It’s so old fashioned and everybody remembers it; once they taste it, they say, ‘Yes, I know that taste’,” Mr Jones said. “Depending on what age you are, it stimulates different reactions from different people. “We get grannies who taste it and say, ‘My mother used to make that, I haven’t tasted that in 50 years’.” “It just transports people back in time.” The dedicated search for the perfect recipe has been well worth it, with demand for the fudgyboombah Scottish Tablet now coming locally, across the state and even internationally. “We didn’t have an old family recipe to fall back on so we had to find our own recipe,” Mr Jones said. “And it took four years to perfect it before we put it out for sale - now it’s our equal best-seller.” It’s one if the unique fudges available at fudgyboombah, which has more than 70 different flavours on sale every day - with recipes for 140 flavours there’s always something different to try. “We rotate the flavours - we have winter flavours, summer flavours, special event flavours,” Mr Jones said. “We even have a 350gram Christmas Pudding Fudge - complete with custard flavoured fudge on top - which we make for just the six weeks before Christmas.” The fudges are accompanied by an array of nougats as well, including flavours like banana, peppermint, mango, pineapple and passionfruit, white chocolate and blueberry, pistachio and cranberry, and nut-free nougats. Fudgyboombahs also sell a specialised range of other sweets - including freeze dried ice cream invented by NASA for its astronauts, the popular BeanBoozled jelly bean game that includes the most bizarre flavours imagined, and numerous other unique sweets. Fudgyboombah is in central Montville at 168 Main St, Montville. Phone contact is 5478 5455. Experience the delights of Montville, Mapleton and Flaxton and make gift giving a breeze! Illume Creations, Montville makes the art of gift giving easy! 10% OFF ALL JEWELLERY DEC – JAN WITH THIS AD. Colour your festive season with locally made treasures. Showcasing local hot glass artists, hand-made bead and dichroic jewellery, raku pottery animals and more. Find us overlooking the view near The Edge Café. For groceries, gourmet foods, a large range of gluten free, fruit and vegetables. Gifts galore and all your Post Office needs including banking! Come and say hi to Chris, Ann & the team! Try our thin and crispy Pizza base with generous toppings at your one and only local Italian Restaurant, Bella Vista Pizza and Pasta in Mapleton. Great views. Gluten free available. Hilltop Gallery / B&B, Flaxton Great gift ideas from Montville, Australia and the World! The Garden Enjoy brunch, lunch, sweet treats or our popular Devonshire Teas in our delightful garden. Dogs are welcome to bring their owners. Our Gallery We have a permanent exhibition of the artwork of Dr. Seuss featuring his well loved characters – the Cat in the Hat, Green Eggs and Ham, The Grinch, Horton and many more as well as his lesser known ‘Secret Art’ Delight the children or take a walk down memory lane. ONE of the attractions of a getaway in the beautiful Sunshine Coast Hinterland is the opportunity for some unique shopping experiences. Come on up for a day or stay for a week and you will fill your days with ease. Montville is famous for the many artisan shops and the ideal place to find a huge range of unique handcrafted goods. There is something for everyone, from admiring and choosing clothing from some beautiful boutiques owned and managed by creative designers, browsing in wonderful galleries showcasing stunning works of art, to discovering cute and quirky specialty shops for gifts and souvenirs. Wood and glass feature strongly in the work of Hinterland artists and retail outlets offer a beautiful range of work. Here we are spoilt for choice and both local and overseas visitors are sure to find a gift or memento that reminds them of their visit to the Hinterland. We stock a unique range of Giftware • Humorous K Design • Quirky Imagine Ellie • Hand painted Happy Hens • Intriguing Framed Butterflies and Bugs • Intricate U Gears Models and much more! Lots to see, so Come On Up VISITORS to the Sunshine Coast hinterland are warned to not make the mistake of leaving the area before they’ve experienced everything The Hinterland and the surrounding communities have to offer. The list of attractions is not as straight forward as many may think – it’s very diverse in deed, as readers will further discover as they flick through the pages of this edition of Come On Up newspaper. The region encompasses the well-known headline towns of Montville, Maleny and Mapleton, but then also boasts the unique attractions that come with the farming and alternate communities of Conondale, the colonial town of Kenilworth with its national parks, bushwalks, and camping grounds, and outlying communities like Kenilworth, Landsborough, Mooloolah, and Palmwoods. The hinterland has well and truly developed a great reputation for its unique and quaint boutique shops, its beautiful coffee shops and restaurants, and the views to the coast that are so readily accessible in Montville itself and along the hinterland’s mountain ridge road. But the lesser-known attractions include the region’s produce and food attractions – visitors are able to visit working farms, organic vegetable and fruit producers, coffee roasters, and spend time cooking with unique locally-made marinades and sauces. There are also speciality breweries manufacturing world quality beers, a boutique liqueur-maker using native bush foods to create unique flavours, cheese producers, and dairy farms that produce the freshest dairy products that need to be experienced to believe, as well as providing accommodation that allows visitors to experience working farms. The natural attractions include countless bushwalks, starting with the 58km Great Walk that meanders from Lake Baroon through the range to finish at Mapleton Falls National Park. Bushwalkers can camp along the route too. Thankfully, the Great Walk doesn’t have to be daunting. It’s conveniently broken up into four sections that are each an individual day walk in their own right. Then there are the shorter bushwalks like those at Kondalilla Falls in Flaxton, Baroon Pocket Dam and Gardners Falls at Maleny, Mapleton Falls at Mapleton, the Charlie Moreland Park camping and picnic area just outside Kenilworth, which has become one of the most visited camping sites in South East Queensland, along with other bushwalk and camping sites and private camping grounds. The natural tourist attractions also boast the greenery and rainforests for which the region is known, all manner of unusual plant life, birds and native animals. The beautiful natural surrounds also lend themselves to romance, with the region home to a blossoming wedding industry, complete with stunning chapels, wedding and function centres, for those wishing to tie the knot in memorable surroundings. The hinterland is a unique and special destination, with attractions that satisfy a wide variety of aspects and interests, and not the run-of-the-mill as some may believe at first glance. It’s all supported by wonderful accommodation, ranging from motel-style rooms through to B&Bs and even farm stays that allow guests to step into their local garden to pick the freshest ingredients - whether vegetables, fruit or even fresh eggs - to go straight to the kitchen and into their delicious meal. So, if you’ve arrived in the hinterland, ready to be refreshed and revitalised, make sure you make the most of your stay and truly properly partake in the many and varied things here to do. And, if you’re still wondering where to go on your next break, the Sunshine Coast hinterland has so much to see, so make sure you Come On Up. THERE is a strong history of fine original art on the Blackall Range. Inspired by the outstanding natural beauty, many professional artists have chosen to live in the area and so there is a wealth of art and galleries to be found in the region. ‘Art on Cairncross’ has a reputation for showing a remarkable diversity of visual art from professional artists with substantial careers. The exceptional quality is apparent, from the unique style of senior painter Rex Backhaus-Smith depicting the very essence of the outback to the exquisite porcelain works by internationally renowned ceramicist Johanna De Maine, many of which feature her interpretations of the Glasshouse Mountains. There are finely executed watercolours, delicate bronze bird sculptures, elegant marble sculptures by Fiona McCarron and breathtaking still life paintings by Ian Mastin. But the works become even more enthralling with Michael Taylor’s leather mask sculptures and Steve Thompson’s steampunk pieces. These are a few examples from the stable of 42 artists in the gallery, where each month finds a different feature or exhibition to be experienced in one room and the eclectic mix across the rest of the space. The levels of creativity and craftsmanship make this a destination gallery, as many have discovered in their over 23 years in business, but directors Tony Gill and Jane Caraffi still pride themselves on ensuring that their service is of an equally high standard. “We believe strongly in our role as the artists’ representatives and love to share the stories behind each work of art…because that is another important aspect of every piece being individual” says Tony. Also representing a selection of fine artists from the Sunshine Coast region and throughout Australia. Artworks include paintings, ceramics, sculpture, glass, leather masks and unique gifts. THE HAMPTONS at Montville is all about lifestyle and choice providing fully maintained common and on-title lawns and gardens. You will love the spacious grass areas that are surrounded by bird and butterfly attracting native trees and plants making it perfect for entertaining friends, family or grandchildren. Beaches are within 30 minutes and the reasonable distance to train, airports and Brisbane make the location impressive. Secure your block now before they are all sold. designed for this community all you need to do is choose your favourite items and colours; alternatively, you could even design your own Hamptons style home. THE AGENTS Jeremy Buultjens is working with Hamish Bolderston. They are experienced agents in the Sunshine Coast market, chosen by the owners for their professional attitude and care for clients. They are a pleasure to work with. Dine on the iconic deck overlooking Lake Baroon, the service is second to none, chances are you will meet George wondering around the restaurant spoiling his guests. Make sure you book before you go. Call Secrets on 5478 5888. Visit Secrets on the Lake this summer a family owned and operated retreat and discover handcrafted carvings, beautiful iron, wood and glass creations that guarantee to surprise and delight you. “SECRETS ON THE LAKE” is a stunning family owned and operated retreat on Lake Baroon’s shores in the Sunny Coast Hinterland… packed with exquisite carvings, artworks and endless beautiful iron, wood and glass creations that guarantee to surprise and delight you. Owners George and Aldy Johnston have crafted their Secrets with incredible creativity and artistic detail to create the ultimate romantic escape for couples or families wanting to immerse themselves in the lush pristine rainforest. It’s a truly unique destination featuring world-class treehouse accommodation, the award-winning Dining on the Deck licensed daytime restaurant, Secrets Art Gallery, and the truly beautiful Secrets Gardens and Lakehouse wedding venues. But it’s not just George and Aldy who have ‘painted’ thumbs… their children Rob and Cath Johnston have also inherited the creative gene and you can spot many of their sculptures and artworks when you visit the iconic Secrets Gallery or explore the elevated boardwalks through the lush rainforest and beautiful lakeside gardens. Rob’s hand carved cedar mirrors are exquisite and a perfect momento of your Secrets’s experience! Daughter Cath Johnston is a nationally recognized Sculptor who has recently returned from 7 years in Victoria and showcases some of her new body of work in the Secrets Gallery. Why not pop in for a great meal in the iconic Dining on the Deck and check out the Johnston creative gene, and enjoy stunning views of the Lake, award-winning food and exceptional service. The adjacent Secrets Gallery features local artworks and the magnificent Dream Tree carving by Jack Wilms. Open 6 days (closed Mondays) serving breakfast from 8.30am, Lunch from 11am - 2.30pm, and afternoon tea until 4pm. 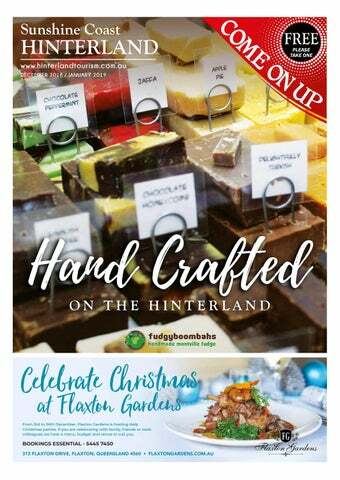 With sumptuous Christmas menu and packages available… it is the perfect place to gather your loved ones and celebrate each other, the beautiful environment, and the vibrant hinterland arts and crafts scene! Imagine the delight in visiting a truly unique destination featuring world-class treehouse accommodation, an award-winning restaurant and gallery, surrounded with lush rainforest and overlooking the magnificent Lake Baroon. Secrets on the Lake is a premier destination in the beautiful Sunshine Coast Hinterland. It’s a family secret! The Sunny Coast’s best kept Secret.... Luxury treehouse accommodation retreat by Lake Baroon at Montville in the Sunshine Coast Hinterland. A peaceful haven 40 minutes from Maroochydore Airport & just over an hour from Brisbane. A place that is uniquely different from anywhere else. Situated on the shores of Lake Baroon and adjoining Obi Obi Gorge and The Great Walk. Many package options featuring our award-winning food. Retreat, canoe, bushwalk, visit iconic destinations or shop in Montville. Contact Secrets staff on 5478 5888 or visit www.diningonthedeck.com. au or www.secretsonthelake.com.au to book. They currently have some great midweek summer saver deals, so it’s never been easier to escape, reenergise, and rejuvenate! Denise Wave, of Caloundra, and Jan Leard, of Bribie Island, get a closer look at the Glasshouse Mountains through the new telescopes at Mary Cairncross Scenic Reserve. The telescopes were funded from the gold coin donations of visitors to the reserve. the traditional local Jinibara word for frog – it emits the sounds made by sixteen local frog species. The Gaya-Phone has two key settings, utilising the sounds of eight of the frogs as they are resting and then the other eight as they sing. There is a third setting that utilises the sounds of the Tusked frog, which has been changed to different tones, so users can actually play it like a musical instrument. The display includes photos of the frogs as well as phonetic spellings of the sounds they make – for example, the “pluck pluck pluck” of the tusked frog, “kraaaaaawk” of the Orange-eyed tree frog, the “tuk tuk tuk” of the Striped marsh frog and more. The display complements an existing bird wall in the main Discovery Centre hall, which allows visitors to press different buttons to hear the calls of native birds at the reserve. Another new attraction at the centre is two new telescopes, so visitors can get a closer look at the Glasshouse Mountains. Both the telescopes and the Gaya-Phone were funded by the gold coin donations paid by visitors to the Discovery Centre. Mary Cairncross Scenic Reserve includes a wide array or attractions, from the tranquil and easy walks through the subtropical rainforest that is the centrepiece of the 55-hectare reserve, through to lovely picnic grounds – complete with barbecues, sheltered picnic tables, expansive lawn and play equipment for the children - and the new and modern Discovery Centre and café building. The Discovery Centre includes numerous displays that provide an insight into the world that exists among the thick foliage and towering trees. It features a number of displays, interactive learning activities, and multimedia presentations that all help to reveal more of this wonderful natural attraction. Mary Cairncross Scenic Reserve provides a understanding of the rainforest that once covered the entire area, and provides an opportunity to take a relaxing wander among diverse birdlife and native animals, as well as a wide array of plant life, from the towering buttressed trees that stretch to the canopy, through the tiniest of mushrooms that feed on the rotting vegetation in the undergrowth below. The reserve sits on the edge of Maleny’s southern escarpment, and provides a stunning uninterrupted view towards the Glasshouse Mountains on the plain below. The picnic grounds and barbecues are free at Mary Cairncross Scenic Reserve; however, entry to the walking track is via the Discovery Centre, which charges the gold coin entry fee. The Rainforest Walk is open 7.00am - 6.00pm. The Discovery Centre is open 9.00am - 4.30pm daily, but closed on Good Friday and Christmas Day and also closed on Anzac Day from 9am – 12noon. Mary Cairncross Scenic Reserve is located at 148 Mountain View Road, Maleny, Qld, 4552. Ph: (07) 5429 6122. Right: The expansive park and barbecue area at Mary Cairncross Scenic Reserve, at Maleny. One thing to watch are the narrow car spaces in the car park. Left: The beauty of the Mary Cairncross Scenic Reserve walking path. A suspension bridge over Baxter Creek, not far from Baxter Creek Falls. THE BUSHWALK between Kondalilla Falls at Flaxton and the Mapleton Falls National Park could be described as the most challenging and also the most beautiful of all four sections of the Sunshine Coast hinterland’s Great Walk. This section of the Great Walk extends around 10.6 kilometres in total, which includes around 3.5km along mainly bitumen and concrete roadways and footpaths at the Kondalilla Falls carpark, along MontvilleMapleton Road at Flaxton and 1.7km walking along Flaxton Mill Road until the track goes bush. It’s also possible to park at the bottom of Flaxton Mill Road so as to skip the first “urban” section of the walk. The 4.3km section of the walk from Flaxton Mill Road, down into Baxter Creek Valley and then back up toward Obi Obi Road at Mapleton, is perhaps the toughest physically of all sections of the Great Walk. It includes a gradual-but-relentless zig-zagging descent as the track makes its way down toward Baxter Creek, before walkers cross a suspension bridge across the creek and then begin the journey back out of the valley and towards Mapleton. It’s not hard to argue with the signage that suggests experienced walkers only should venture along the walk. While the tracks are very good, in some parts they are narrow, they include quite a number of steps, and can be slippery when wet. It’s a great workout for the lungs and thighs. Walkers of moderate fitness should allocate around 2.5hours to complete this 4.3km section, one way. The walk is perhaps less popular that other more-publicised sections of the Great Walk like the section from Baroon Pocket Dam to Kondalilla Falls, as well as the shortest section that encompasses Mapleton Falls National Park, but its beauty is unmatched. Most noticeable are the presence of many huge birds nest ferns and staghorns growing in trees. There are also the tell-tale huge tree stumps, with their axe holes, that are a reminder of the logging days long gone – how the workers back then managed to move those massive trees through the forests to the timber mills is astonishing. This section of the Great Walks is sporadic with its mobile phone signal, so it might be advisable to switch to airplane mode when not being used to avoid running the battery dead. as you are. Released from the rough, carefully shaped, and polished to perfection. It's rare, it's precious and utterly unique. There will never be another one like it. We know that what we do is something very special because there is nothing quite like the moment when an opal captures your heart. See the full collection in-store or online . Accommodation establishment in their favourite part of the world. The property is a spacious modern Queenslander homestead set on over 11 acres with Hamptons themed styling. It is designed to accommodate a small number of guests in a secluded, serene and private luxury rainforest environment but close to all that the Sunshine Coast and Hinterland offers the discerning visitor. Holiday ideas in the Hinterland IF YOU are stuck for ideas of how to keep the family entertained during the holiday season you may want to consider a couple of fantastic natural destinations located right here in the Hinterland. Ewan Maddock Dam is located in the picturesque Mooloolah Valley and is only about an hour’s drive north of Brisbane. To get there simply take the Landsborough Exit off the Bruce Highway and then turn onto Steve Irwin Way. Follow this road along and then take the Mooloolah Connection Road and in no time you have reached your destination. Work on the dam began in 1976 and in 1982 the 660 metre-long dam was constructed across Addlington Creek. The dam was named after Ewan Maddock who was one of the first European settlers who pioneered the area. Once at the dam, you can enjoy a raft of outdoor activities including fishing, swimming, bushwalking and kayaking, as well as a selection of excellent trails which are ideal for horse riding and mountain biking which are all located beneath the spectacular Glasshouse Mountains. Ewan Maddock Dam is also a fantastic place for picnics and barbeques as well as being the perfect spot for birthday parties, weddings and family gatherings. Ewan Maddock Dam is also a fantastic place for picnics and barbeques as well as being the perfect spot for birthday parties, weddings and family get togethers. After you have explored all that Ewan Maddock Dam has to offer you could drive up the range towards Maleny and visit Gardner’s Falls. To get to Gardener’s Falls, turn off of Landsborough-Maleny Road onto Obi Creek Road. Follow Obi Creek Road to the car parking area. From here, there is a sealed path that follows the Obi Obi river and leads you right to the falls. When you get to the falls you will be amazed by the natural beauty of the rainforest and the rock pools that are ideal for young children to explore and splash about in. For the more adventurous, there is a large rock pool with rope swings. Once at the falls you could try your luck at fishing or perhaps come prepared with a picnic and take advantage of the tables which are located right at the water’s edge. WHEN someone mentions “handcrafted” my mind immediately springs to the imagined character of those involved. “Handmade” or “handcrafted” has a real sense of individual contribution. In my imagination I conjure up dedicated artisans in remote cottages hunched over peat fires in the Hebrides with outside toilets, horizontal driving rain, subsisting on dried fish and whiskey, with questionable standards of personnel hygiene and an unhealthy attraction to stocky damp hairy cattle with horns. The Hinterland has an enviable reputation for handmade and handcrafted items which correctly reflects its artistic heritage. Alas there are to my knowledge no peat fires here. The food is just brilliant, we wash frequently and drink our fine wine and handcrafted beer even more frequently. I have always hoped that the crafts person of yore, the “hand maker” of fiction, might just be still lurking in the bowels of Booloumba or the wilderness of Witta. Take for example the Woodcarver. I picture a shingle clad cottage with ageing timber slabs against the wall. Moss covered apple trees, a stone hearth and an old man with a profusion of white hair, wispy beard, leather apron and hands like ancient tree roots endlessly whittling with pipe in mouth. He wears a yellow waist coat to match the colour of his teeth. On his shoulders it is sawdust not dandruff and there is a strong smell of linseed oil and French polish. He sits knee deep in wood shavings carving cuckoo clock cases. Then there’s the visual Artists. To be an acceptable visual Artist in the “Handcrafted” idiom you need a garret and we don’t seem to have plentiful garrets in the Hinterland. Also you need a paint- besmirched smock and to be in the final stages of consumption. It is essential that you imbibe significant quantities of Absinthe, a 19th century drink of the ‘artistic set’ with an alcohol content that makes you lose arguments with inanimate objects. I have a theory that the French Impressionist movement was fuelled by Absinth. That vague, hazy Renoir look was in fact what you actually see if you consume too much of “the Green Fairy”. It was never “impressionism” rather the reality of overindulgence. You could say there was essentially a belief amongst artists of that era that “Absinthe makes the art grow stronger!” My image of Basket Weavers is that they should live in a clay and wattle cottage by a pond with an outbreak of reeds and goats and with underwear crafted from potato sacks drying on the line. They have carrot red hair and a beard to match that resembles a poorly tended shrubbery highlighting early elements of lichen and the remains of last night’s vegan pie. They need piercing blue eyes, look marginally demented and can trace their ancestry back to a lamentable and eminently forgettable bog in southern Ireland. Some of you may find basket weaving as interesting as a village cricket match in Pakistan with all the glamour of a blunt farm instrument. You are wrong. Place an imaginary basket weaver of Celtic extraction on the dance floor, fuelled with some doubtful alcohol extracted from decaying potatoes. With the screech of fiddle and a manic Gaelic songstress who sings about something personal that she eternally lost on the banks of the Liffey (a sound similar to a 747 with engine trouble) he will dance just as he weaves with extraordinary energy and fury. The danger of course is that at the end of this musical interlude he will envelope you in an embrace of everlasting brotherhood, the fumes of the fermented spud and the rancour of the underarm. All of which is about as appealing as bowel surgery in the rainforest with a stick. University of the Sunshine Coast and our potters may well be rotund, rosy and jolly and play the bagpipes on wet Thursdays. What is true is the fact that collectively they produce truly world class art. Christmas beckons and the challenge again arises to seek out that gift of unique and special quality. Come up to the Hinterland. The art will speak for itself. The artisans I will leave to your imagination! Maleny Tropical Retreat Ranked 3rd for accommodation on the Sunshine Coast and 24th for Queensland by Trivago. This unique Balinese luxury retreat creates tranquillity and harmony, including private walking tracks to the Obi Creek. Providing spectacular views, the accommodation ranges from new villas to B&B suites and cabins. Highly ranked on TripAdvisor. From 5pm Thursday, 4pm Friday & 12 noon Saturday & Sunday. Visit the Beerwah Hotel- it’s well worth the drive Tuck into our fabulous food. Sunshine Coast Hinterland - Come On Up is a free independent magazine published bi-monthly. We believe the best person to ask about an area is a local. 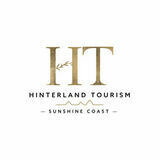 Sunshine Coast Hinterland - Come On Up is produced by locals in partnership with the peak tourism organisation Hinterland Tourism Sunshine Coast and is jam packed with facts, useful information, local stories and stunning images of the region. A pull out map, driving and walking map helps visitors to see and experience the best in the Hinterland.